Official figures for 2016 won’t be available until later this year but attendees at the annual Languages Canada conference, held this week in Quebec City, came away with plenty of reasons for optimism that international student numbers in Canada will be trending up through 2017. In a seminar that closed the official conference programme, StudentMarketing CEO Samuel Vetrak forecast a bright future for Canada’s competitive position in international education markets. He particularly noted improvements in student visa processing, attractive currency exchange rates, a consistent marketing effort by Canadian recruiters in key sending markets overseas, and a global political context – notably international reaction to the new Trump administration in Washington – that are all expected to boost Canada’s attractiveness as a study destination this year. The point was echoed during a special panel of Canadian trade commissioners held earlier in the week. Representing Canadian embassies in Brazil, Colombia, Panama, and Mexico, the trade representatives all indicated a growing interest in Canada as a study destination. Michael Bailey, senior trade commissioner at the Canadian Embassy in Mexico City reported a dramatic increase in attendance at Canadian education fairs in Mexico this year. “Canada is now the destination of choice for Mexican students,” he said, pointing out that the favourable exchange between the Mexican peso and the Canadian dollar and the easing of visa requirements for Mexican visitors in 2016 would be important drivers of increased Mexican tourism and study travel to Canada in 2017. The strengthening outlook for inbound mobility to Canada comes against the backdrop of two contrasting trends. The total number of foreign students in Canada grew by 92% between 2008 and 2015, and by 8% between 2014 and 2015 alone. There is every indication that that upward trend continued through 2016, even with notable pressure on some important sending markets for Canadian educators, such as Brazil and Saudi Arabia. Within that overall trend of increasing enrolment, however, Canada’s ELT (English Language Teaching) sector saw a decline last year, with student numbers falling off nearly 3% and student weeks down by almost 5% compared to the year before. As the following chart reflects, Canada was the fourth-ranked ELT destination in 2015, a year in which other receiving countries, Australia and Ireland in particular, saw real enrolment growth in English language programmes. Canada’s ELT enrolment has been pressured by increased competition internationally, but also by some important regulatory changes over the last two years. New visa regulations introduced in 2014 effectively removed work rights for ELT students in Canada. And in July 2016, Immigration, Refugees and Citizenship Canada (IRCC) changed its processing guidelines for international student files involving conditional admissions. Under the new processing policy, visa officers are instructed to issue a study permit – that is, a Canadian study visa – only for the period of the student’s prerequisite studies. As a result, students are now required to apply for a further study permit to cover the period of their planned academic programme – a departure from the previous practice which saw visa officers issue a single study permit for the entire duration of both language and academic studies. IRCC officials also gave a programme update in Quebec City this week and indicated that they are now actively consulting with Canada’s ELT sector on both of these important policy areas. While no formal announcements were made at the conference, IRCC representatives noted recent discussions with the ELT sector will shortly lead to new proposals for further amendments to policies governing conditional admissions processing as well as work rights for ELT students. IRCC expects to send draft guidance out to ELT providers in Canada for further comment in the near future. For now, IRCC is reporting improved performance with respect to visa processing in 2016, and notes in particular that approval rates for language studies have increased over the last two years, from 63% in 2104 to 73% YTD November 2016. 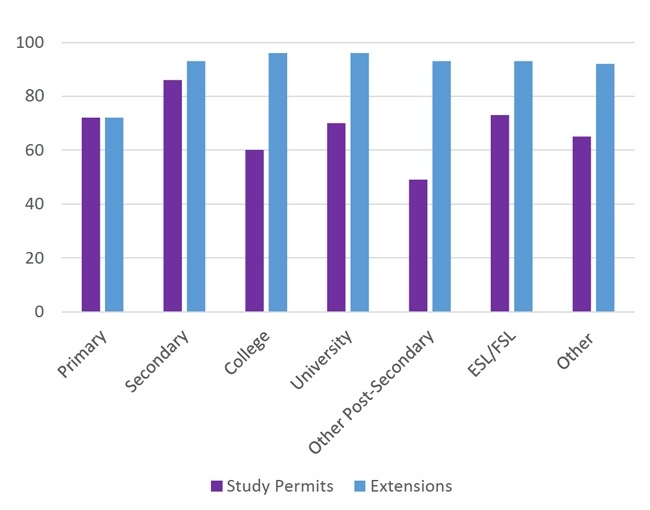 IRCC reports as well that processing times for Canadian study permits have held steady since 2014, in spite of dramatic increases in the number of applications received. In 2015, 92% of visa applications were processed within IRCC’s 60-day service standard. Earlier data from IRCC indicates that the average processing time for such applications is roughly 47 days. 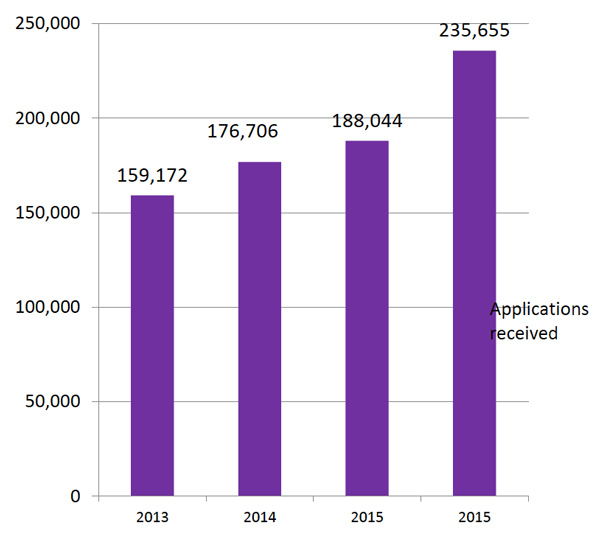 As the following chart illustrates, visa application volumes grew sharply in 2015 with a 25% increase over the year before. IRCC reports that growth rates, in terms of the number of student visas issued, more than doubled between 2015 and 2016. Overall, the year-over-year growth rate, in terms of the number of student visa holders in Canada as of 31 December, nearly tripled in 2016. In another trend that will reflect in 2017 enrolments, IRCC is also reporting a record-high number of study permit applications received for the period September-December 2016. This entry was posted in Canada, Language Learning, North America, Regions and tagged universities with international students, international students, study abroad, English language teaching, English learning in Canada.